Eating in the middle of the day, several hours after breakfast, re-energizes your body and can raise blood sugar levels when focus and concentration are flagging. If you’re feeling sluggish, eating even a small lunch can renew your energy and help you feel refreshed and ready to take on the next several hours. In addition, eating lunch keeps your metabolism active, especially if you have a moderately sized meal and a snack before and afterward. Are you guilty of skipping lunch occasionally? Do you feel your day overwhelming you towards the evening? Stop Skipping lunch this month with Oz Soylent. We are also happy to introduce some newbie-friendly way to consume the nutritious Oz Soylent Shake! It is not always clear how one consume Oz Soylent. 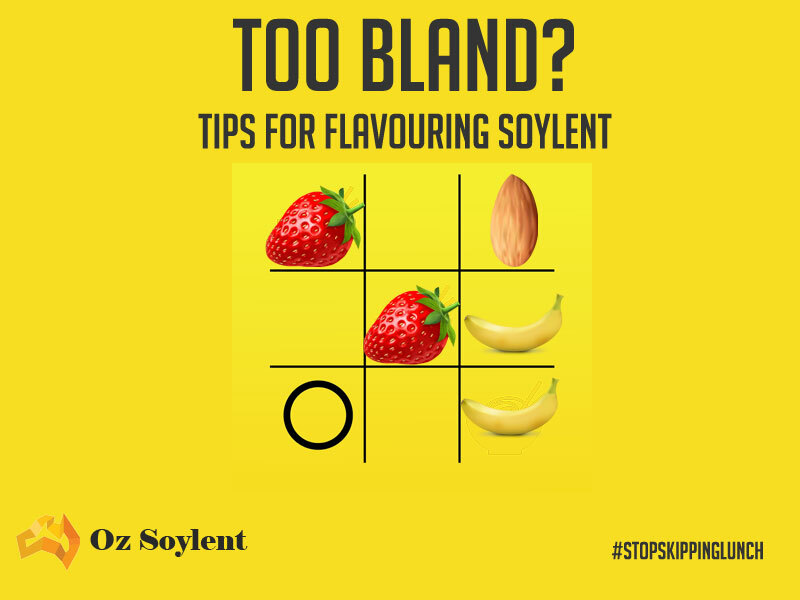 Today we have some tips on improving the taste and texture when consuming Oz Soylent. Adding fresh or frozen raspberries/strawberries is a good idea to add some new sweet and sour flavours to Oz Soylent. It is also a great way to add some antioxidant to your healthy meal. For those who ordered the originial Oz Soylent, the flavour is neutral and slightly sweet at best. If you prefer to add your own chocolate flavour, or try our premade chocolate Oz Soylent. Adding coco or milo powder to your Oz Soylent will make it pleasantly tasty. Need your daily fix of caffeine? Brew 3 cups of coffee and use it instead of water. Wait for the coffee to cool before putting it into the pitcher. Adding Banana adds the sweet flavour many people wants in an oat-like meal or shake. Highly recommended by many customers, sliced banana is the number 1 recommended companion for Oz Soylent. The nut family is such a great addition to any cereal meal or shake, they go superbly well with Oz Soylent. Adding healthy nuts also increase the protein of the Oz Soylent alone. Have any other ideas, let us know below, share it with the world! Nice article here! I personally find adding sliced banana and walnut a great combo for soylent shake. The added texture and sweetness helps alot!